StudioJewel – Journey of a Jeweler: Check out my Slide Show! Disc Cutter – love at first hit! One of my favorite tools in my studio is a disc cutter. I was first introduced to this tool in a metals class. I was feeling very uncreative so I thought I would explore the different tools in the studio. Who knew it would be a defining moment! It truly was love at first site. I was instantly inspired by the perfect little circles that immerged from this tiny tool. The possibilities, the options…I could hardly wait to create something from these tiny metal wonders! So you ask…”what exactly is a disc cutter?” Well a disc cutter is just that…a simple tool that cuts discs. Duh! But there is oh, so much more to it than that. The tool itself comes in many different shapes and sizes. The model that sits on my bench is a small block of high carbon steel with 10 different cut out circle shapes. The block is actually two blocks that fit securely together on two pins. This keeps it perfectly aligned, but allows it to slide up and down on the pins for ease of movement of your metal sheet. For each cut out circle shape in the block there is a corresponding steel punch beginning at 1/8″ diameter and increasing in increments of 1/16″ up to 1″ in diameter. The use of this amazing little workhorse is simple! Lift the top block slightly, so it’s raised but not lifted completely off the pins. Slide your metal sheet (maximum thickness 18 gauge) in between the blocks. Line it up with the hole you would like to punch, find your matching punch and slip it in the hole. Now comes the fun part! Take your hammer and pound, pound, pound until you feel the punch go through the metal. Oh, it is a glorious moment! Lift the block and viola’! You have a perfectly cut disc! Such a beautiful thing. You may say, “big deal…so you have a circle!” But a circle really is an amazing shape, and the possibilities are only limited by your own imagination. I have used this workhorse to create some of the most popular pieces in my line. In fact, there barely is a day that goes by when you cannot hear the tap, tap, tap of hammer pounding out these little babies! A disc cutter can be found in almost all the major jewelry supply catalogs. Contenti has a small model very similar to mine for $54.50 (see picture above). RioGrande has many options in size and price, but you do have to sign up at the website to view their virtual catalog. As you set up your bench for the first time, or are adding tools little by little…I highly recommend adding a disc cutter to your list of tools. At the very least you will be satisfied by the freedom of hammering away and getting out all your frustrations! So go on metal artists! Make some circles!! I belong to a group called EtsyMoms. They have put together this fun basket to raise money for the Ronald McDonald House. So go, check it out and place your bid! EtsyMoms…Please vote for your favorite Item here. 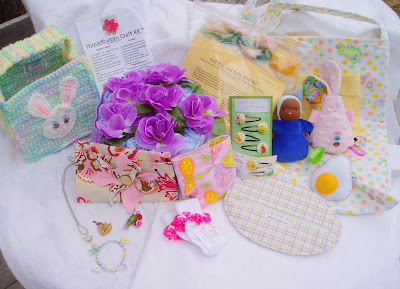 Buttercup Corner has another craft kit, felt an egg and a chick to go inside! It’s absolutely darling, and a perfect activity for the family. WylesStyle made this super cute egg pouch. Perfect for a teen’s Easter, you know how hard they can be to buy for! BeadedSocks makes cute doll diapers and… beaded socks! The doll diapers are a favorite among the toddlers, and they hold up to rough toddler play much better than disposable dipes. Thumbelina Creations made an amazing pendant with lampwork beads, buttons, and wrapped wire. Be sure to check this out in more detail (click her name) to see it ‘up close’. Well tomorrow my 8 year old is having her tonsils out. I know it’s not a “big deal” when it comes to surgery…but it is a BIG deal when it comes to my child. She’s apprehensive…naturally…and quite frankly so am I. The whole idea of the hospital, and putting her to sleep kind of freaks me out. I wish I could go through it for her and then let her reap the rewards of the results!! I guess that is quite a typical feeling for a mom! In addition to the stress of the actually surgery. My husband and I are feeling the weight of the financial stress of the surgery as well. WOW…who knew it could cost so much. And who knew our insurance was such a bummer. So all day I’ve wrestled with what to do, how to make it work. And the truth is, I have no answer. She needs the surgery, we’ve determined that. As for the money, that’s when my faith HAS to step into the picture. God and I have been a little at odds lately. Not because I doubt his existence, or even his love for me…but sometimes I think he might be preoccupied with everyone else. Yet in my heart of heart I also know that is not true. So maybe through Isabel’s surgery I am the one learning the lesson of even more dependence and faith. First of all, he loves her even more than I do…hard to imagine…and he has a plan for her little life. Second, he loves me too and he even has a plan for my ridiculous life – and more importantly he really cares…a lot! Thanks for letting me rant and rave. Pray for my little one tomorrow if you think about it. And remember, he really does love each and every one of us. He made us, he has purpose for us…and for pete’s sake…he even suffered and died for us. If he was willing to do that for me almost 2000 years ago, I’m pretty sure he cares about what I’m doing today. So what in the world am I worrying about anyway! !